The establishment of Christianity (and a particular form of Christianity at that) as the official, state religion occurred later closer to the end of the century under Theodosius I, when it first became illegal to engage in public pagan religious practices. Even after this, especially in the eastern empire, secular law and ecclesiastical canons remained largely distinct and separate until fairly late in Byzantine history, and the involvement of the emperor in the Church was mostly limited to adjudicating intra-Christian doctrinal disputes. Non-Christians and heretics were under legal disadvantages because of their beliefs, but in most cases they were left in peace. 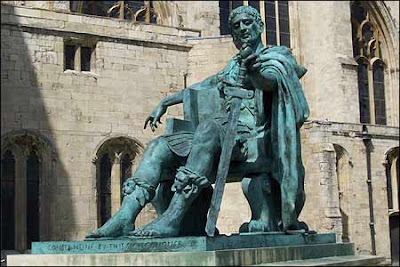 What more than a few historians and theologians have dubbed Constantinianism had nothing to do with Constantine. For that matter, it had very little to do with Byzantium later on. Like the equally mythical concept of Caesaropapism, the picture of a church intertwined with and directed by the imperial government is the product of modern historiography reacting against church-state relations that prevailed in the Reformation and Counter-Reformation. The phenomenon of state churches in which the secular power ruled over the church directly began with Henry VIII and repeated itself throughout northern Europe. This particular fusion of politics and religion was a decidedly modern phenomenon, and had little to do with ancient or medieval practices in Byzantium.